The citizens of Pittsburgh who struggle with chronic health problems now have a new set of options to monitor their conditions from the comfort of their own home. Thanks to Automated Security Alert and their TeleHealth services patients can save time and money without compromising the quality of their health care. The TeleHealth system uses some of the latest medical technology while remaining extremely simply to use. 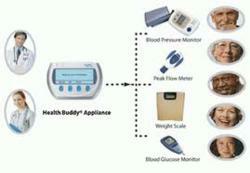 There are many versions of the TeleHealth device which can monitor different aspects of most health problems. Some of the conditions that can be monitored from home include: Congestive Heart Failure (CHF), Chronic Obstructive Pulmonary Disease (COPD), Diabetes, Asthma, Cancer, Coronary Artery Disease (CAD), Chronic pain, Depression, Hypertension, Pediatric Asthma, and more. The different devices can monitor vital signs and electronically report the results to the patient’s doctor or caregiver, saving the patients from having to pay for a visiting nurse or from taking the time and expense to travel back and forth to their doctor’s office. If the vital signs are not where they should be, action will be taken to get the patient the help they need. Patients with diabetes can rest easier because there is also version of the TeleHealth system that can monitor their blood sugar levels as well. Other options with TeleHealth devices can be programmed for the patient to answer a series of questions to determine their day-to-day symptoms to get an overall picture of their health, taking the place of a visiting nurse asking the same questions. The answers that the patient gives will also be reported to their care team. Although the TeleHealth system can accurately monitor vital signs, blood sugar levels, and ask for information, the device is intended to be incorporated into a patient’s medical care routine. TeleHealth is not intended to take the place of physician-monitored health care. If you or a loved one are struggling with a chronic health condition, please contact us at our Pittsburgh office today to see how we can help you make your condition easier and more economical to manage. Automated Security Alert, Inc. was founded in 1988 in Munhall, Pennsylvania. The company uses the newest technology to enable senior citizens, physically challenged persons, and recovering patients to maintain an independent lifestyle in their homes. Automated Security Alert offers a variety of medical alarms, medication management systems, and telehealth services.